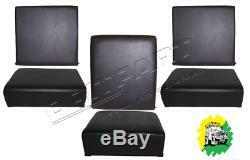 Land Rover Series 2 3 S111 Set of Standard Front Seats 6 Pieces DA4305. In the event of a problem with your item. All prices shown include VAT. Pictures and part numbers are be used for reference purposes only. Listing and template services provided by inkFrog. The item "Land Rover Series 2 3 S111 Set of Standard Front Seats 6 Pieces DA4305" is in sale since Thursday, January 17, 2019. This item is in the category "Vehicle Parts & Accessories\Car Parts\Interior Parts & Furnishings\Car Seats". The seller is "mclandrover" and is located in Oswestry. This item can be shipped worldwide.